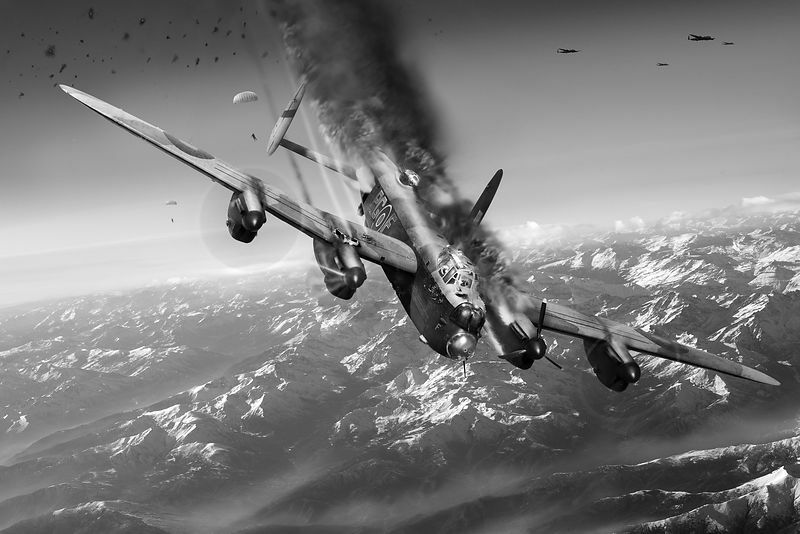 This depicts the shooting down of Lancaster LM756, PG-F of No 619 Squadron RAF on 25 April 1945 during a daylight operation against Hitler's Eagle's Nest retreat at Berchtesgaden in the Bavarian Alps. The operation involved 359 Lancasters and 16 Mosquitos from RAF Bomber Command's 1, 5 and 8 Groups. LM756 was one of six Lancasters from 619 Squadron, based at RAF Strubby in Lincolnshire, which went in ahead of the main force to disrupt the German radar defences by dropping metal foil 'Window'. They had a clear run at about 22,000ft over their particular bombing target - the SS barracks - but then were coned in anti-aircraft fire and shot down in flames. Three men bailed out successfully: flight engineer Fred Cole, bomb aimer Art Sharman and wireless operator Jack Speers. An eye-witness said rear gunner Gordon Walker jumped at the last second but was fatally injured, and three others were still in the aircraft: Wilf DeMarco (Pilot), Norman Johnston (Navigator) and Edward Norman (Mid-upper Gunner). This is a black and white version of a commission by Kevin Ruane MBE for the Mayor of Adnet in Austria, Bürgermeister Wolfgang Auer, who has raised a memorial to the four crew who died when F for Freddy crashed in flames on the outskirts of his town. I wrote this blog post about the story behind the picture. Some other articles that might be of interest: History is Now and National Post (Canada).